J.J. Zep.com: Dancing With The Dead: Why This Obsession With Zombies? Dancing With The Dead: Why This Obsession With Zombies? Zombies are back! Not that they’ve every really been away, but there was a time when their status as the connoisseur’s monster of choice was under threat from vampires and werewolves. And I’m not talking about bloodthirsty counts and rip- your–head-off wolfmen. I’m talking about weird creations that walk around during the day and seem more concerned with how their hair looks than getting in a gallon or two of the red stuff. But while vamps and wolves continue to move truckloads of books and fill movie theaters, the Z’s are fighting back. The fourth series of “The Walking Dead” recently launched to an estimated audience of 11 million and you only have to do a search on Amazon to see how many new books are being written. And if they’re been written, they’re selling. 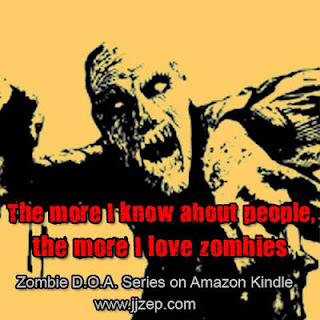 I can vouch for this with my own Zombie D.O.A. series. So what is it about zombies that we love so much. In my opinion it’s two things. Firstly, Zombies are apocalyptic. A poltergeist will scare the living bejesus out of the residents of a haunted house, a vampire or a werewolf may scare up an entire village or town. But with zombies it’s terror on a global scale. Game over. You can run but you can’t hide. The other reason I think we love zombies so much is that, unlike the other famous monsters, zombies could actually happen. I’m not talking about the dead rising from their graves to eat our brains here - but something like a rage virus escaping from a lab, a la 28 days Later? Quite possible, maybe even likely at some point. And even if it isn’t a zombie virus that causes the end of the world - let’s say it’s a meteor strike or a nuclear war - you’re still likely to have hungry hordes roaming the countryside looking for…meat! Sounds very much like Zs to me. My advice? Next time you watch a zombie movie or read a zombie novel, check out the guys that survive. Take note of what they do. Who knows, it may just save your life one day. Just kidding…well, half kidding anyways. Here's a clip from the Walking Dead to get you started.